It’s hot out there; who wants to cook? Not me. So what I worked on this week are summer salads. Ho hum, right? Potato salad, cole slaw, macaroni salad? Same old same old. I came up with two wonderful new recipes inspired by other, pre-existing recipes and worked them over into wonderful new dishes with my (and Ellen’s) personal twists to make a balmy summer evening absolutely sing with new flavors. Standard ingredients, new applications. Here’s what we’ve got. Among the things upon which Ellen and I agree is that we don’t much like creamy potato salads; you know the ones–potatoes, celery, mayonnaise, salt and pepper–not much about which to get excited. Enter Eating Well magazine. Eating well is something I excel at, although “well” is a bit of a stretch. The magazine means healthy; to me, “eating well” generally means enjoying what we’ve made to the extreme. In this case, I’ll stick to (relatively) healthy–no mayo in this potato salad, just a beautious blend of herbs and spices that make a summer day feel like a celebration. This month’s issue of Eating Well features a choice of potato salads that are different from the norm almost as much as they are different from each other. The second recipe is a variation on a Mexican bean salad, with a tangy cumin/lime dressing that is similar to one that has long been one of our favorites. It’s like a bean salad I wrote about a couple of years ago, but with a twist in the dressing. The dressing started with the Food Network’s Ellie Krieger, but I’ve worked it over to my liking, and I sure do like it. Better, although the original is delicious. I think you’ll like both recipes. 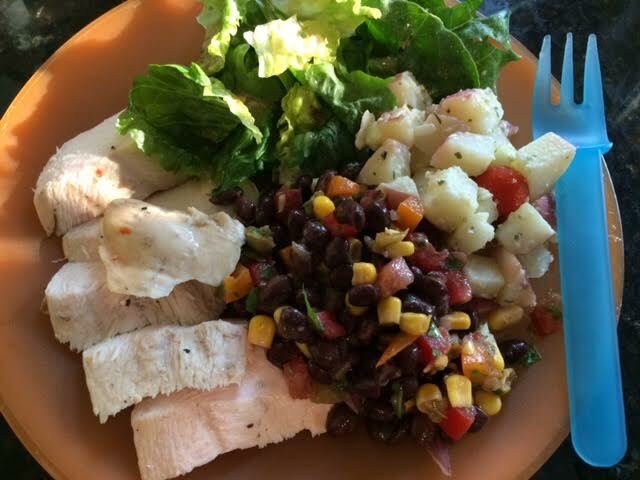 We served them with grilled chicken and freshly torn romaine lettuce and the same dressing as in the beans. Fabulous! Scrub and dice the potatoes to a ½-inch dice and place on a steamer basket above one inch of water in a large pot; steam until tender, 12-15 minutes. Place the potato dice on a baking sheet, sprinkle with ¼ teaspoon kosher salt and let cool for 15 minutes. Then gently place them in a large bowl. In a separate bowl, whisk together olive oil, vinegar, shallot, mustard, and salt and pepper. Add the tomatoes, Feta, olives (or not ;), cucumber, and oregano to the potatoes, then drizzle the dressing into the bowl. Toss gently, so as not to break up the potatoes, and add salt and pepper to taste. Place the bowl in the fridge for at least two hours, then serve. Place the first seven ingredients (beans through cilantro) in a large bowl. In a separate, smaller bowl, add the zest, juice, cumin, chipotle pepper, salt, and white pepper, and stir to mix well. Slowly drizzle the olive oil into the dressing bowl whisking constantly to create a mixed dressing that thickens as you add the oil. Pour over the salad ingredients and toss to coat the salad well. Serve immediately to get all the flavor from the tomatoes and cilantro, or chill for later serving. Both these recipes are tasty and reasonably healthy, and go well with anything grilled. Try ‘em both!